Light from the universe’s very first stars still lingers in space. Now, astronomers have a new way to catch it: Distant, ultra-bright galaxies that act as cosmic beacons, capturing relict photons in a blaze of gamma rays. Studying these stellar fingerprints will help astronomers learn more about the universe’s earliest years — and its first inhabitants, which are too far away to be seen directly. Now roughly 13.7 billion years old, the universe is thought to have switched on the first stars about 400 million years after the Big Bang. To circumvent this problem, Ajello and his colleagues used the orbiting Fermi Large Area Telescope to study distant blazars, a type of bright, active galaxy. Blazars are powered by supermassive black holes that shoot enormous jets of energy toward Earth. 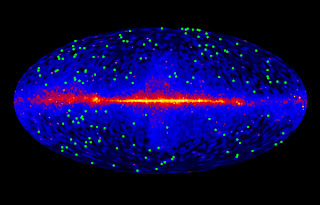 The jets include gamma rays, a high-energy form of radiation that can interact with photons from the early stars. Photons colliding with a blazar’s gamma rays are converted into electrons and their antimatter particles, called positrons. The transition produces a dimming effect that the Fermi telescope can detect, and the amount of dimming corresponds to amount of photons between Earth and the blazar. Since blazars are distributed across the universe, astronomers can use them to measure the photon fog at different ages, and calculate the contributions from early stars. 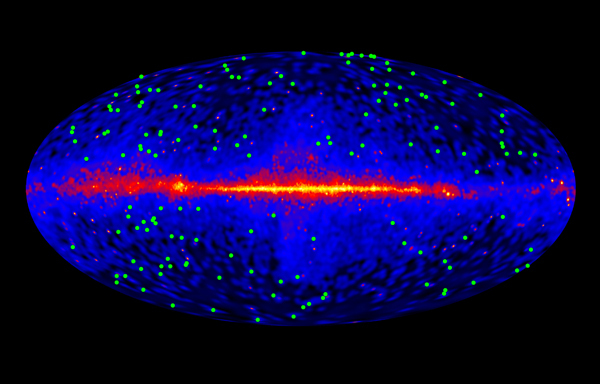 Ajello and his colleagues used 150 blazars to parse these early photons from the rest of the cosmic melee. So far, they’ve managed to peer at the shimmering universe as it appeared when it was just 4 billion years old, and the team plans to follow up with blazars at greater distances and earlier ages.